I really love jewellery, even more so now that I actually work in a jewellery shop. I've treated myself to a few pieces of jewellery throughout the years I have worked there but one thing I haven't bought myself are bracelets or bangles, purely because I can never find one to fit me. I have really tiny wrists so whenever I try on a bracelet at work/in a different jewellery shop/in New Look, everything I try on is far too big for me so it just slips off and falls onto the floor. 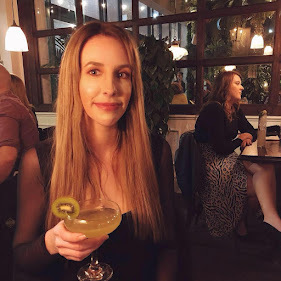 Defeated and finally getting used to the fact that I can only wear bracelets designed for 8 year old girls, I have finally found a bracelet to fit my child-sized wrists and it comes in form of the Daniel Wellington Rose Gold Cuff in Small. "The Classic Cuff was designed to reflect the captivating beauty of our minimalist watches. With its casual yet tasteful allure, the aesthetics of the cuff is a true celebration to the impeccable craftsmanship behind all of Daniel Wellington's timeless designs. 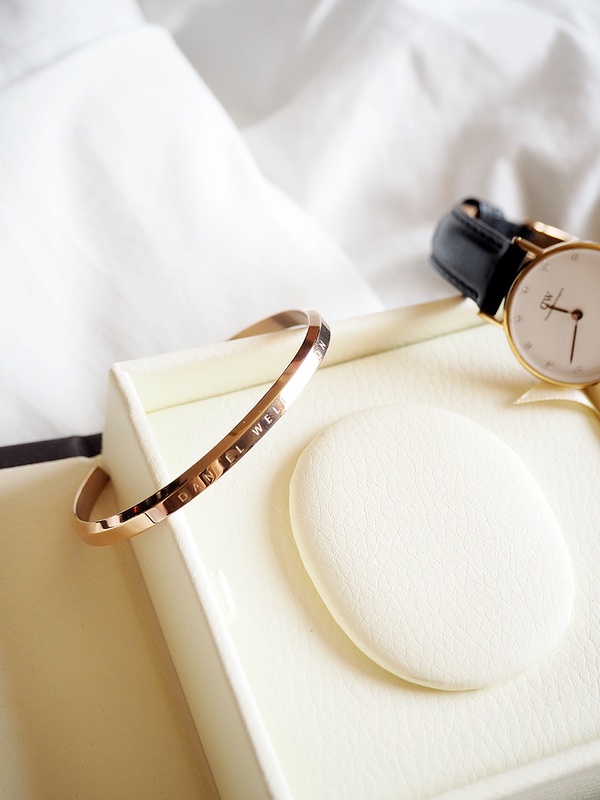 The rose gold cuff is crafted from refined and polished 3I6L stainless steel core with a rose gold plating. The Small size measures 6 inches in circumference." 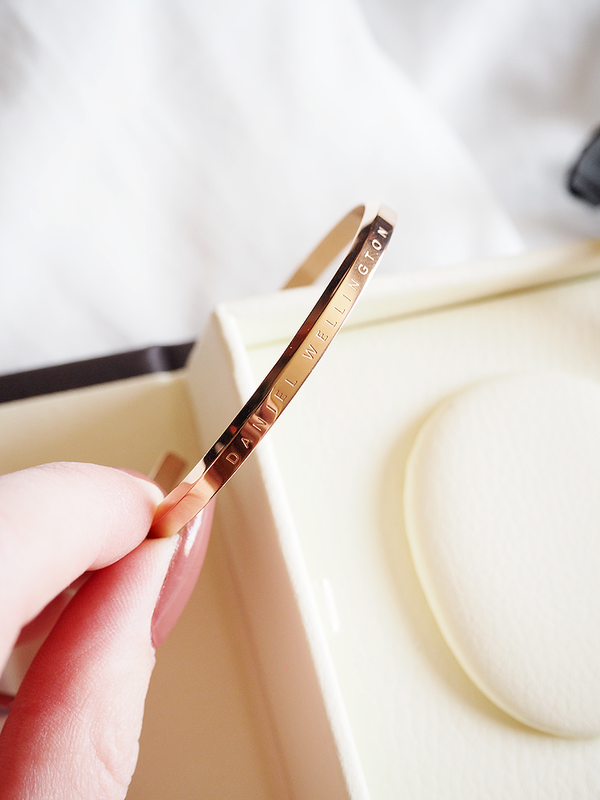 The Daniel Wellington Rose Gold Cuff is so simple, which is why I love it. I already own the Daniel Wellington Classy Sheffield watch which has rose gold hard-wear to it, so it made sense to get a matching cuff too. Available in rose gold and silver, the Daniel Wellington cuffs come in either Small or Large sizes, with the Small measuring 6 inches in circumference and the Large measuring in 7. The cuffs themselves aren't made out of either silver or rose gold - in fact they are made out of stainless steel. They feel really solid and hard-wearing so I have no worries about it snapping or breaking easily - something which may happen more readily on a bracelet or cuff made out of hollow silver. I will be honest and say that when I pulled the cuff out of the box when it arrived, I couldn't help but laugh. It looked tiny! So much so that I wondered if it were actually made for a child but it actually fits like a dream. It fits me perfectly and it compliments my watch wonderfully too. If it were a little too big or a little too small, you can ever so gently widen or tighten the cuff by squeezing or pulling on either open end but fortunately I didn't need to do either. 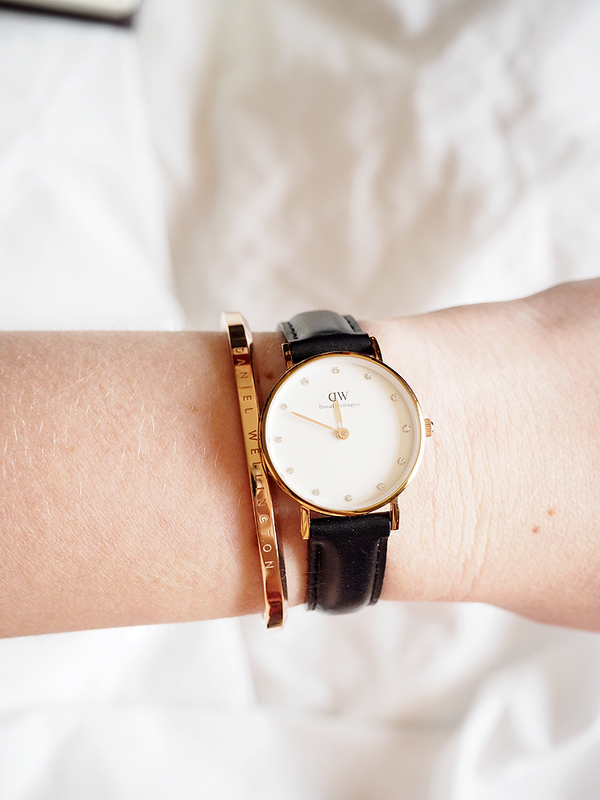 I'm utterly obsessed with this bangle, not only because it is simple and classic, but because it fits! Love this piece! So pretty. Makes such a good combo with your watch! This is so nice and in a way timeless! I've wanted a cuff sort of bracelet for a while now so I'll look into this one! It is best simple design watch of Daniel Wellington, It is my favorite brand I have used this watch once. Find the best store to buy the modern and trendy watches at best price. Wonderful piece of watch with gold cuff, It's really beautiful. It is the best combination of watch and cuff. Get the offers of unique collection of Classique Elegance Watches Online at the best price. I really love the image of this watch. Looking for the amazing collection of watches then, get measure wrist for watch which will go with your outfit.